JEFFERSON CITY – Speaking on the topic from the pulpit for the first time, Frank Page discussed the death of his 32-year-old daughter during Father’s Day services at Concord Baptist Church here. Page, the president and chief executive officer of the Southern Baptist Executive Committee, said that while it was difficult for him to recount the trying period in his life, he hoped it would shed light on the problem of suicide in the church and point those struggling to the only source of hope for the hopeless: Jesus. 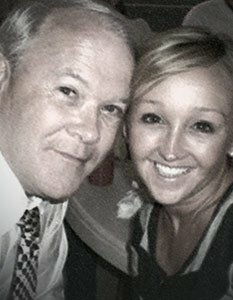 He began sharing that – like all fathers – he treasured his children and looked forward to a Father’s Day text or call from two of his three daughters, but not his eldest, Melissa. I miss my baby. Badly. But I don’t have to grieve like those that have no hope. Page said Melissa struggled with behavioral issues, addiction and depression her whole life. They all came together the day after Thanksgiving, 2009. She called her dad and told him she loved him. She hung up the phone and didn’t answer when Page called her back. He rushed to her home, but when he arrived the police met him at the door and said she had already been transported to a local hospital. Page said he still grieves for his daughter – especially on a day like Father’s Day – but knows the peace of Christ. Though this was the first time he’s spoken on the subject to a church, Page recently wrote a book, Melissa, A Father’s Lessons from a Daughter’s Suicide, which tells more of the same story. Though he doesn’t tackle why suicide occurs, he does discuss questions such as is suicide an unforgivable sin, spiritual warfare and offering steps to victory in Jesus. Based in Scripture, each chapter includes a portion specifically for people who may be considering taking their own life.